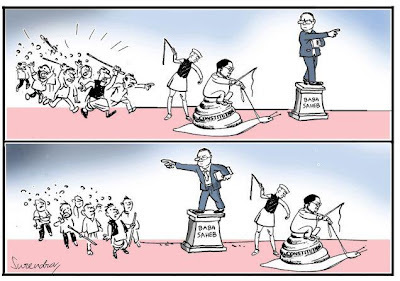 Parliament was rocked (May 2012) with the discussion on the alleged insult of Dr. Baba Saheb Ambedkar in the cartoon in NCERT text book for standard XI. The MHRD Minister immediately declared the withdrawal of the book and asked for review of all books for which a committee has been appointed. This is yet another instance where the intent and meaning of the said cartoon has not only been misrepresented but also the hype has been associated with the alleged insult of Dr. Ambedkar. 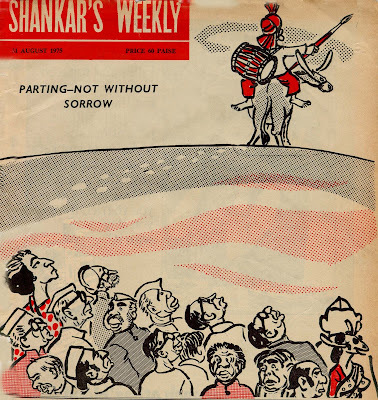 Interestingly this cartoon appears in the book, which is part of a series, brought out by NCERT, which can easily be rated as of being of very high standard, being very lively and incorporating the core issues related to the politics of the country. The cartoon by one of the foremost Indian cartoonist, Shankar Pillai, shows Dr. Ambedkar sitting on a snail and prodding it to go faster. Behind the snail Pundit Nehru is standing prodding the snail to move faster. The whip in the hands of Nehru, in no way is directed against Ambedkar, but is directed against snail. Ambedkar is in command of the snail, which is depicted as the process of making of Indian Constitution. 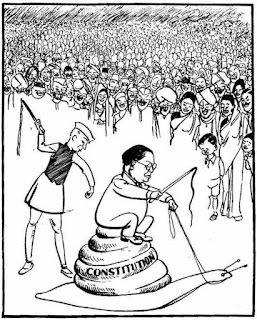 The reading of the cartoon, put extremely creatively in the book, is to show the slow pace of the constitution making process. In what way this is against Ambedkar, defies the logic in toto. The dalit leaders who have raised the issue, Ramdas Athawaley, and later supported by Mayawati and others needed to think more on the lines, as to why Constitution making process was at snail’s pace rather than picking up a totally misreading of the point and making it an emotional issue. On the same issue some youth rampaged the office of Prof Suhas Palshikar, who has been the advisor of NCERT committee, which went into the making of this book. What a paradox, the person who drafted a Constitution giving us freedom of thought and expression, in his name the same freedom of expression is being throttled. 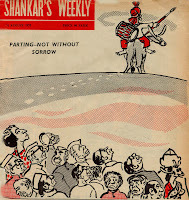 The cartoon was made in late forties, when Ambedkar and Nehru both were very much there, and surely both must have mused at the cartoon and realized their helplessness in pushing the speed of Constitution making rather than penalizing the legendary cartoonist Shankar. The whole episode raises multiple questions. None of these relates to the plight of dalits and Indian constitution. One recalls that just a decade ago NDA Government led by BJP had undertaken the exercise to ‘review’ the Constitution on the grounds that it needs to change. That time dalits stood in unison and saw the designs of BJP, the political arm of RSS, to change the secular democratic structure of constitution and to replace it with one based on Hindu holy books as desired by the RSS in its pursuance of its agenda of Hindu Rashtra, was thwarted. A decade later we need to be more concerned about the threat to the values of Indian Constitution rather than focus on an emotive issue related to the same. Why was the Constitution making process slow? Is it because Dr. Ambedkar wanted it to be slow? Not in the least. It was slow despite the best efforts of Dr. Ambedkar and despite full support from Nehru, because the opposition to this process was prevalent all around. 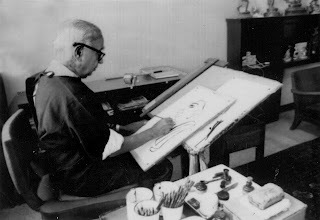 RSS chief M.S. Golwalkar articulated the opposition to this process by saying that we don’t need a new Constitution as we already have the 'glorious' constitution in the form of Manusmriti. One recalls here that the chief architect of Indian Constitution Dr. Ambedkar had burnt Manusmiriti on the grounds that it has provisions of slavery of Shudras and women. The process of Constitution making was slow because communal orthodox forces were not for the social change which the Constitution envisaged. Those following the values of Ambedkar need to focus more on the fact that the forces which were making the process slow have become stronger today and are posing an obstacle to the issues of social justice even today. Social justice was the major plank for Dr. Ambedkar and even while introducing the draft of Constitution in the Constituent assembly he pointed out that with this Constitution we are entering the era of ‘One Man One Vote’, i.e. political democracy, but the social democracy seems to be still a goal not very easy to achieve.